Welcome to my website introducing the wolf spider fauna (Lycosidae) of Australia! This website, its concept and design date back to about 2002, and much has changed since then. 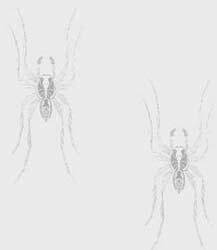 In particur, the World Spider Catalog now hosts pdf's of all historic and recent taxonomic papers on spiders and it is not necessary anymore to make taxonomic illustrations of spiders available here (or elsewhere). Hence, many of the recently described species do not have their own pages here, just download the respective paper from the World Spider Catalog. I'll update the taxonomic literature as quickly as possible. I am currently (June 2017) updating this website, which I haven't done for a long time. Be aware that it curently includes errors, in particular on those pages that are outdated (check date at bottom of each page!). For an up-to-date listing of all spider species of Australia, including wolf spiders, check my 'Checklist of Australian Spiders' (http://www.australasian-arachnology.org/download/checklist_australian_spiders.pdf). A compilation of data for each species currently recognized in Australia, which can be accessed by the 'Species list' link in the left window. Each species page contains taxonomic information, illustrations of the species (if available) and in some cases data on its biology. Some genera are also introduced. A compilation of data on synonyms, nomina dubia and replacement names. If you can't find a suspected Australian wolf spider in the species list, have a look here! A bibliography with all relevant references to Australian wolf spider taxonomy, systematics and ecology. In addition, there is a short history and overview of Australian wolf spider taxonomy containing information on the number of currently recognized species and genera. Unfortunately, the Australian wolf spider taxonony is still in its infancy and it is not possible to provide a genus or species key. This is partly due to C. F. Roewer's taxonomic work in the 1950s and 1960s, which resulted in a generic placement of species, which does not represent their phylogenetic relationships. Please have a look at the acknowledgements, as this work would not have been possible without the support of many collegues, friends and scientific journals. Last, but not least: I am grateful for all e-mails [volker (dot) framenau (at) museum (dot) wa (dot) gov (dot) au] with comments on the list. In particular, let me know if you like it, or if you find mistakes!